rosemary | What's Green with Betsy?!? Don’t Let Mosquitos Bother You This 4th of July! Fourth of July is around the corner – fireworks, barbeques, games, swimming, camping and all those other wonderful outside summertime activities, and mosquitos. For those of us who are mosquito magnets and looking for a safer alternative to DEET, there are personal insect repellents containing botanicals like citronella, basil, lavender, geranium, lemongrass, peppermint, rosemary, cedarwood, and tea tree. While these are mildly effective, the longest lasting and most effective botanical is Oil of Lemon Eucalyptus, according to the Environmental Working Group. (The Environmental Working Group is a consumer watchdog organization dedicated to protecting human health and the environment.) In fact, the CDC recently confirmed that Oil of Lemon Eucalyptus can be as effective as DEET in repelling mosquitoes. Oil of Lemon Eucalyptus is a plant-based repellent oil made from the leaves of the Eucalyptus Citriodora tree from tropical northeastern Australia. A 30% concentration of Oil of Lemon Eucalyptus (with 19% PMD, a naturally occurring substance) provides up to 6 hours of protection against mosquitoes and ticks. Repel makes a Lemon Eucalyptus Insect Repellent Pump Spray and is available on-line. I prefer to support local cottage businesses selling insect repellents at my local Farmers’ Market. Check yours to buy some too. When buying a mosquito repellent, always read the ingredients to make sure they include Oil of Lemon Eucalyptus (not to be confused with eucalyptus). For more ideas for mosquito control, click here. Summer goes by quickly – don’t let mosquitos and ticks keep you inside! Oil of Lemon Eucalyptus is not for use on children 3 and younger, can possibly irritate lungs and has possible allergens. Does your pet have fleas? Fleas are more than just a nuisance to your pets (and humans); they can also result in severe skin problems. As with everything, prevention is key. Once they take hold, it’s hard to get rid of them. Bathing your pet regularly, using a flea comb daily, regular vacuuming of pet areas and washing pet bedding will help stop fleas. You don’t need chemical shampoos either – the lather will drown them. Fleas attack weaker pets, so it’s important to keep your pet healthy with regular check ups and nutritious food. Garlic and yeast supplements in your pet’s food help repel fleas from the inside out. The odor and the extra B vitamins make the pet less tasty. Most pets however, succumb to fleas at some point. The female flea lays her eggs in dark, damp places such as cracks in the floor or a corner of the basement. The flea spends the majority of its lifecycle away from the host animal and attacks the pet only when they need food. But most flea control products are aimed at the adult fleas and are highly toxic to the pet and humans. Also, much like humans and antibiotics, a certain amount of the flea population becomes resistant to the chemicals, requiring more and stronger chemicals for effective treatment. The best control should be directed instead at the eggs and larvae to prevent future generations from being born. If your dog spends a lot of time outdoors, a biological control using nematodes, tiny worms, can be sprayed on your lawn and brings about 90% decrease in the number of flea larvae. Inside, try sprinkling a boric acid product in your carpet. Boric acid is inexpensive and effective in killing flea larvae, yet does not harm pets or humans due to its extremely low toxicity. Another product to sprinkle on your carpet or directly on your pet is Diatomaceous earth, a fossilized algae that resembles chalk dust. It penetrates the waxy coating on a flea’s exoskeleton, causing the flea to die from dehydration. Use a mask when applying so you don’t get it in your lungs. Several herbal sprays, shampoos and flea collars whose odors repel fleas can be found at natural food stores, garden shops and on line. Their primary ingredients are cedar wood, citronella and rosemary. Of course you can always make your own repellant – See below for a simple recipe from Jill Reichert’s The Joy of Green Cleaning. Combine all the ingredients and place in a spray bottle. Shake until mixed thoroughly. Shake bottle before using. This does not need to be worked into the skin. The smell will repel fleas and ticks. Information compiled from http://www.alt4animals.com/flea.htm, motherearthnews.com, care2.com/greenliving and Green Living, The Environmental Magazine. Along with the cookouts, volleyball games, hiking, camping and other glories of summer come mosquitoes and ticks. But who wants to use pesticides or products containing DEET, which has been associated with a variety of health problems ranging from dizziness to seizures with children being particularly susceptible? There are several safer and effective alternatives. A garlic spray in your yard provides excellent control. Garlic has a natural sulfur which repels insects, including mosquitoes, ticks, fleas and even black flies, yet does not harm humans, pets, bees, butterflies or plants. Since mosquitoes are soft-bodied insects the garlic juice can be very toxic to them in increased concentrations. Mosquitoes are also extremely odor sensitive and the garlic can repel them for up to a month or more, as long as they can still detect an odor. Farmers have been using garlic for generations. Organic based landscaping or pest control companies often offer a garlic spray or you can buy a product called Garlic Barrier and do it yourself. For small areas like patios or decks, certain aromatic plants keep mosquitoes away. Marigolds planted with pungent herbs like catnip (nearly 10 times more effective than DEET) and rosemary are effective and make attractive containers. I planted the new “mosquito plant”, which grows fast and seems to work. 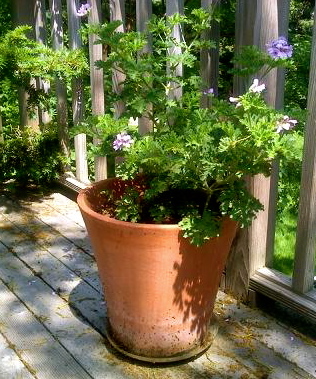 This scented geranium was specifically designed to keep pests away. For personal repellents sprayed directly onto your skin, soybean-oil-based products have been shown to provide protection for a period of time similar to a product with a low concentration of DEET (4.75%). Other ingredients usually include pure plant extracts like citronella, cedarwood, eucalyptus, geranium, lemongrass and peppermint, which are natural, effective and have a nice aroma. Buzz Away and Bite Blocker are good brands that are potent and long lasting. Two cultural practices, don’t keep standing or stagnate water around where mosquitoes can breed and consider putting up a bat house. Mosquitoes are the primary food source for bats and some species eat up to 1000 of them an hour!